In order to synchronization with Trello you need to set up a connection between your story map to a Trello board. You need to be a Story map Admin in StoriesOnBoard and a normal user on the Trello board you’d like to sync with. I assume that you already have a story map and a board and in Trello and lists are also defined on that board. Please create them if they are not exist yet. I’m using the MapShop sample map in this guide. 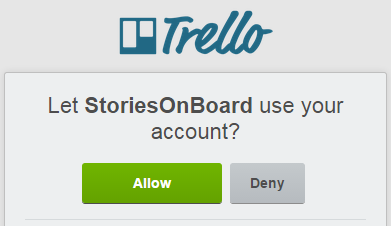 Allow StoriesOnBoard to create and update cards on behalf of the logged in user by clicking on the Allow button. The popup window should close after that. Similar to the setup above is recommended for most projects. It means that on your story maps you’ll get a higher level (aggregated) overview, where you can plan your releases and in Trello you’ll have the detailed lists needed for the implementation (of course in Trello, you can have as fine grained process as you need for your projects). If sync name and description changes are checked, when a title or description changes in Trello or on your story map, the changes will be also visible in the other system (after a refresh). If checked, a new menu appears on the board where non-admin collaborators can also import new cards from Trello. Connect your map with the Trello board by saving the settings. A confirmation will be asked, because after establishing the connection to a Trello board, the cards’ statuses will be set by the connected Trello cards’ statues, which means you won’t be able to change them on the board and now they are all being reset to “Todo”. disable integration temporarily, if you don’t want to send new cards to Trello or sync their statuses, title and description for a while in either of the systems. disconnect Trello, if you’d like to connect to Trello with another user or connect to a different tool like JIRA or Pivotal Tracker. Congratulations! Your story map is connected to a Trello board. Read along to find out how to keep your map and your Trello board in sync.